Last year saw a rash of superhero films and I believe the consensus was that we as a moviegoing public were pleasantly surprised with how they turned out. While each of us may have had a different favorite overall, as a class, the superhero films of 2011 faired rather well. Now the number of films in 2012 I believe is less but the expectations are greater, which makes it a little strange that it kicks off with Ghost Rider. Now as is the case with any of these films I do preface it with my personal history with the character as I feel it does matter. 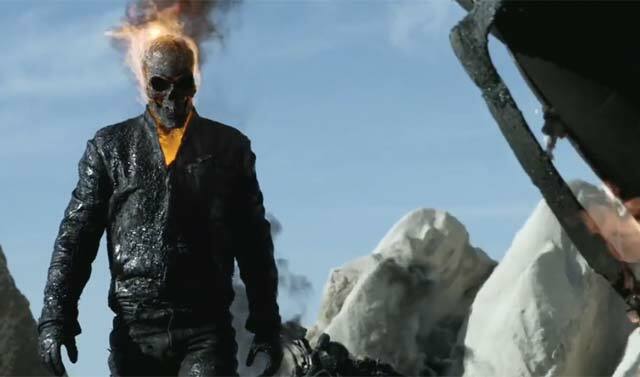 So far as Ghost Rider is concerned, though I have returned to the comics fold in the past few years, I know nothing about him coming into this film, which I think is likely the ideal for any of these films but it was a strange experience. Strange in as much as I can’t say I disliked this movie but only barely. I certainly found it very flawed and wanted many things to be better but I didn’t hate it. Not a ringing endorsement but a true and modest one. Part of the reason I decided to watch this film was that it was reported in trades and elsewhere that it’d be a reboot and it kind of was but bearing that in mind it really skimmed over the pretty decent backstory this character has. Of course, owing to my ignorance of the character maybe the origin is even better than indicated here but it’s rushed through in a voice over. Granted we’re all weary of origins at this point but if you commit to something touted as a reboot you’re committing to re-sketching the character for dopes like me who know next to nothing about him. The other issue is that much of the story hinges on two rites one religious and one irreligious that are really rather simplistic and anticlimactic considering how high the stakes are and how huge the tasks. Such large accomplishments with obstacles so small are rather silly. This contributes to a certain inoffensive flatness in this film. It’s never really un-enjoyable but in this sequel that should’ve been the fix it seems the risk-taking is non-existent and the peaks and valleys of emotion are kept at a bare minimum. In a similar vein to the above rite issue there’s also the problem that our hero gets a temporary reprieve from his gift/curse and that too is granted and reversed a bit simply. This dichotomy should be allowed to build and perhaps shouldn’t even be tackled in the “first” film of a storyline but the saving grace is that it is corrected cleverly. I’ve written quite a few times on the conundrum of Nicolas Cage. A Nicolas Cage who is locked in can be a great thing. A Nicolas Cage just going through the motions can be very hard to watch. This turn is much closer to the former than the latter, which is good because aside from Ciarán Hinds, as his nemesis, and relative newcomer Fegus Riordan who is caught in the middle of the battle, he gets little help from the supporting cast. The special effects in the film are pretty good but the 3D is not as good as one might expect a native 3D film to be. In summation, I did like the story both of the character and that the character is in. Clearly, the way in which it is rendered leaves something to be desired. Essentially, it’s sin is not quite enough ambition as opposed to The Green Lantern but I do find it to be an adequate, enjoyable and not dissatisfying film.